Azevedo with Sonoma County Supervisor James Gore. Photo courtesy of the Economic Development Board. 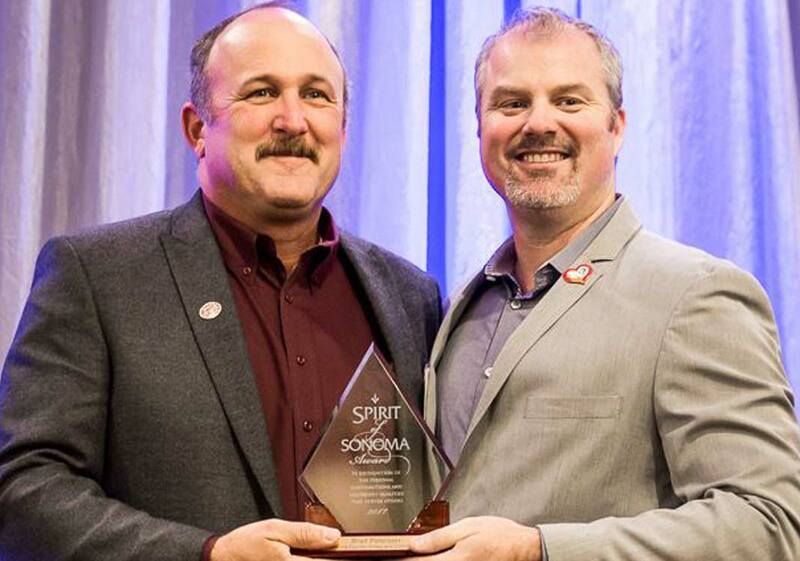 John Azevedo received a Spirit of Sonoma Award on December 8th. Azevedo with his wife Alicia, who he recognized for supporting him. Photo by Rachel LaFranchi. 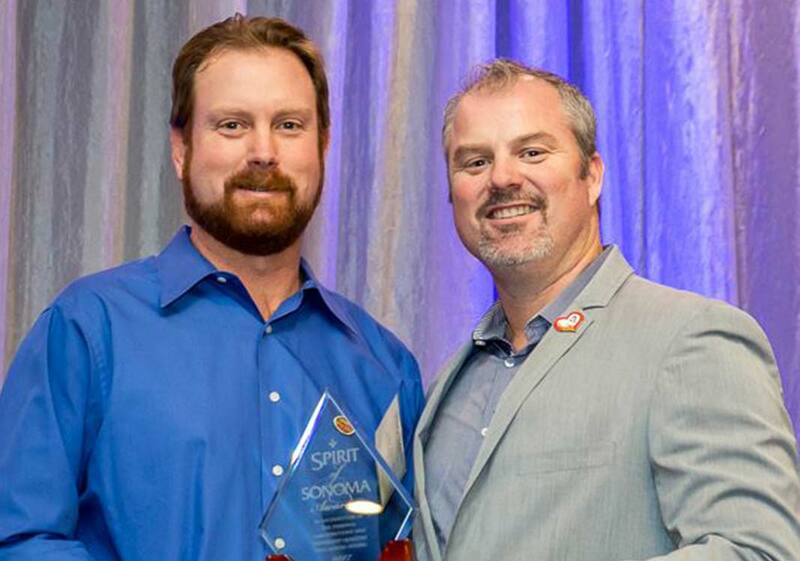 Brad Peterson was presented a spirit of Sonoma Award by Supervisor James Gore. Photo courtesy of the Economic Development Board. 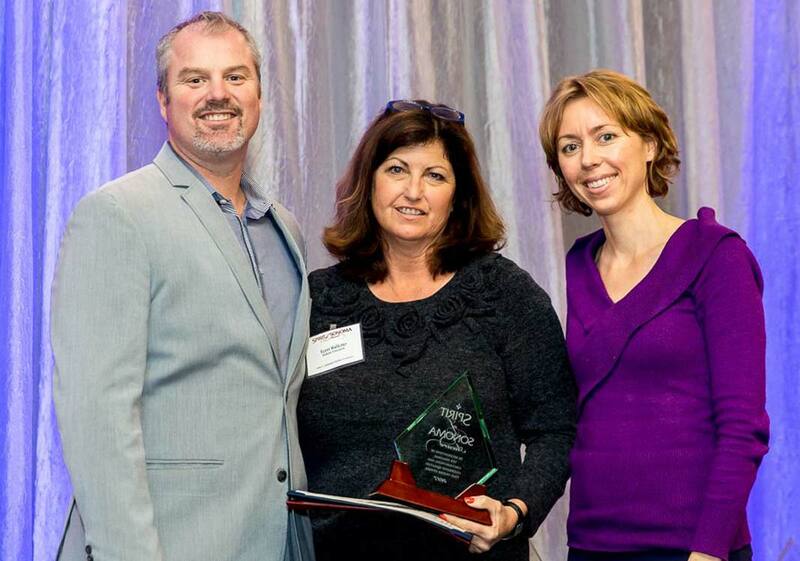 Terri Balletto received the Spirit of Sonoma Award presented by Supervisors James Gore and Lynda Hopkins. Photo courtesy of the Economic Development Board. Past Farm Bureau President John Azevedo received the Spirit of Sonoma Award on December 8th. The event, sponsored by the Sonoma County Economic Development Board was held at the Double Tree Hotel in Rohnert Park. Azevedo was recognized alongside 19 other recipients at the 17th annual awards ceremony. The Spirit of Sonoma Awards recognize the leadership and positive contributions that business and agriculture leaders, chambers, and trade groups give to our local economy and community. Azevedo is a Sonoma County native and fourth generation farmer. He grew up in Healdsburg on his family’s farm which has been operating since 1904 and was a member of Healdsburg FFA. He has a degree in viticulture and is currently the Vice President of Precision Farming at Jackson Family Wines. Azevedo has served on Sonoma County Farm Bureau’s Board of Directors for 16 years and completed his term as President at the end of 2016. Through his involvement with Farm Bureau, John has chaired the Natural Resources Committee, served on a stakeholder group for the Riparian Corridor Ordinance and has been involved with issues related to land use and farming. Azevedo is actively involved in the community, currently serving as the President of the Healdsburg FFA Ag Boosters. In the past, he has served on the boards of the Sonoma County Vineyard Technical Group, Sonoma County Winegrowers and Healdsburg Future Farmers Country Fair. He also participated in the California Ag Leadership Program. 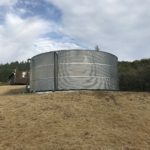 Azevedo is passionate about Sonoma County agriculture and works diligently to keep the industry viable and supporting the next generation of agriculturalists, embodying the Spirit of Sonoma County. Azevedo resides in Healdsburg with his wife Alicia, who he acknowledged at the awards ceremony for supporting him. 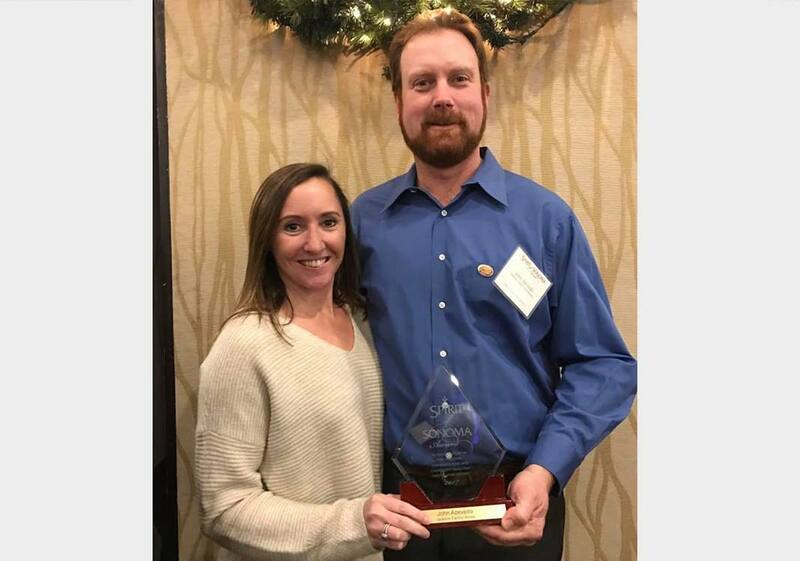 Among other recipients were John and Teresa Balletto of Balletto Vineyards, nominated by the Sebastopol Chamber of Commerce. The Ballettos are dedicated to family farming and giving back to their community having both served on many non-profit boards. The Ballettos are known throughout Sonoma County for their generosity and commitment to making the community a better place. Brad Peterson, a vineyard manager for Silver Oak and Twomey Cellars, was nominated by the Sonoma County Winegrowers and comes from a multigenerational farming family in Sonoma County. Brad serves on the board of the Sonoma County Winegrowers, SAVE and is a past president of the Geyserville Kiwanis. 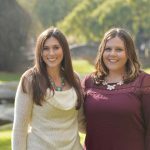 Sonoma County Farm Bureau congratulates all 20 recipients!